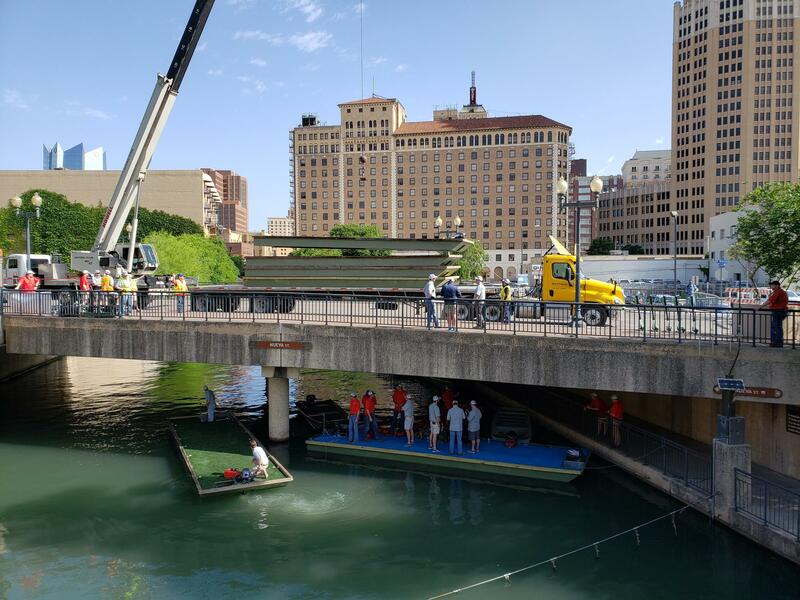 A giant crane lowered 32 barges into the San Antonio River Friday as organizers prepared for the Texas Cavaliers River Parade on April 22. The group nicknamed Friday’s event “barge-in day.” Each barge weighs as much as a small car, the group said. 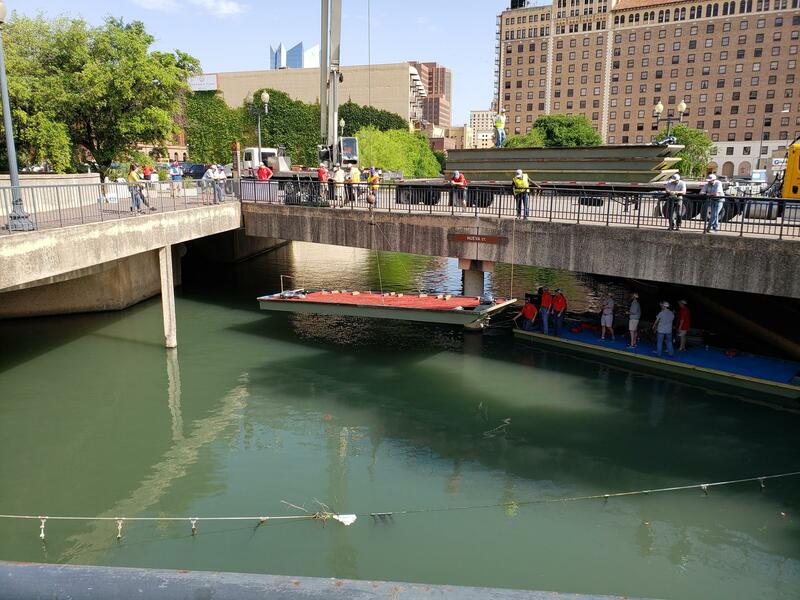 The organizers expected more than 200,000 people at the first of three major Fiesta parades on the Riverwalk, according to Scott Christy, the Texas Cavaliers River Parade Marshal. Christy said about 50 Cavaliers volunteered to launch the barges from the river bridge at East Nueva. He said the volunteers then drove down the waterway to a spot where the barges will be decorated for the parade. “They go to the city marina for our decorator in the events company, who shows up on Sunday and decorates them up to the minute we cast off for the parade,” he said. The parade organizers said the barges weighed 3,000 pounds. The barges are refurbished every year between parades. The group raises money for children charities. This year they plan to donate $800,000 to Morgan’s Wonderland, a North Side theme park designed special-needs children and their families, Christy said. Overall, he added, the group will donate $1.5 million to charities. The Cavaliers hold 18,000 tickets for reserve seating with a starting price of $14. Christy said when the reserve tickets run out, people who want to attend can stake out other public right of ways along the river. Now that the barges are refurbished and seaworthy, the decorating begins in the coming days. The theme of this year’s two-hour long parade is “It’s Showtime San Antonio.” The float decorations will salute movies, television, music and sports,” Christy said. Leon Coffee, a fixture of the San Antonio Stock Show and Rodeo and Pro Rodeo Hall of Famer, will serve as honorary grand marshal. Coffee is famous for his clown acts both inside and outside a barrel to distract bulls from attacking cowboys during a rodeo. Workers race to build a music stage on the campus of St. Mary's University. Carnival rides are assembled. Food booths are arranged in neat rows. And then there's the oysters -- thousands of oysters. All of that means only one thing: Oyster Bake, Fiesta 2019's first big party, is here.